The Pocket Idiot's Guide to Italian Phrases, Second Edition, is truly the only Italian phrasebook readers will ever need. It employs language-immersion principles similar to 'The Complete Idiot's Guide to Learning Italian', a distinctly unique approach in Gabrille Euvino's books. Now with more phrases than ever, it also includes extensive word lists and verb charts. Nearly five million Americans travel to Italy for business and pleasure each year. 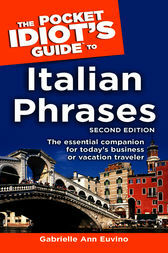 Completely revised and updated with the most current Italian idioms and phrases. New, streamlined grammar and pronunciation sections for easier, more effective use. Includes tips about Italian culture and dialects, and a clear, practical map of Italy. GABRIELLE EUVINO, author of 'The Complete Idiot's Guide to Learning Italian' has been teaching Italian since 1986 and is the President and founder of 'La Bella Lingua', an educational immersion program where students visit Italian historical ladmarks while learning the language and culture of Itraly. She teaches Italian at the Learning Annex in New York City.